Isaac Hayes' Chef character got a true "South Park" sendoff Wednesday night — seemingly killed off but mourned as a jolly old guy whose brains were scrambled by the "Super Adventure Club." The thinly disguised satire continued the show's feud with Scientologists in its 10th season premiere on Comedy Central. 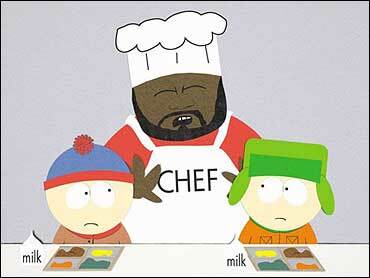 The soul singer has voiced the Chef character in "South Park" since 1997, but left recently because of what he called the animated show's religious "intolerance and bigotry." Founders Matt Stone and Trey Parker said Hayes, a Scientologist, was mad that "South Park" mocked the religion in an episode last November. A rerun of that Scientology episode was mysteriously pulled off the air last week amid published reports that actor Tom Cruise, another Scientologist, had used his clout to bury it. A Cruise spokesman denied that. Hayes didn't participate in making Wednesday's episode; the character's lines appeared to be patched together through tapes of past dialogue. Chef repeatedly said he wanted to "make sweet love" to the "South Park" elementary school kids — it seems the "Super Adventure Club" turns its members into child molesters. The children try to rescue Chef, but in the end he turns to head back to the "Super Adventure Club" — until he falls off a bridge onto rocks, is burned, stabbed and mauled by a mountain lion and bear. "A lot of us don't agree with the choices the Chef has made in the last few days," one of the children eulogizes him at a funeral. "Some of us feel hurt and confused that he seemed to turn his back on us. But we can't let the events of the past few weeks take away the memories of how Chef made us smile. "We shouldn't be mad at Chef for leaving us," the eulogy concludes. "We should be mad at that fruity little club for scrambling his brains." The door for Hayes' return wasn't completely closed. In the show's final scene, members of the "Super Adventure Club" try to revive Chef, and it's not clear he's really dead.